We use a very multidisciplinary approach to study transcription and chromatin organisation in budding yeast (Saccharomyces cerevisiae), including modern genomics and proteomics combined with genetic, biochemical and biophysical approaches. As most chromatin factors are conserved from yeast to humans, our research contributes to the understanding of the molecular mechanisms regulating gene (mis-)expression in humans. Transcription by RNA polymerase II (RNAPII) requires disruption of nucleosomes in front of the enzyme, a process facilitated by high levels of histone acetylation. However, reestablishment of the original chromatin organisation over genes is necessary to prevent transcription initiation by RNAPII from intragenic, promoter-like sites that results in the production of non-coding (nc) RNA otherwise. Over gene bodies Set2-mediated methylation of histone H3 at Lys36 (H3K36me) recruits the Isw1b chromatin remodeller which ensures together with Chd1 that existing, H3K36-methylated nucleosomes are preferentially retained (Smolle et al., 2012). By limiting nucleosome turnover the remodellers prevent the incorporation of new, highly acetylated histones that favour the production of ncRNA and thereby maintain normal patterns of gene expression. 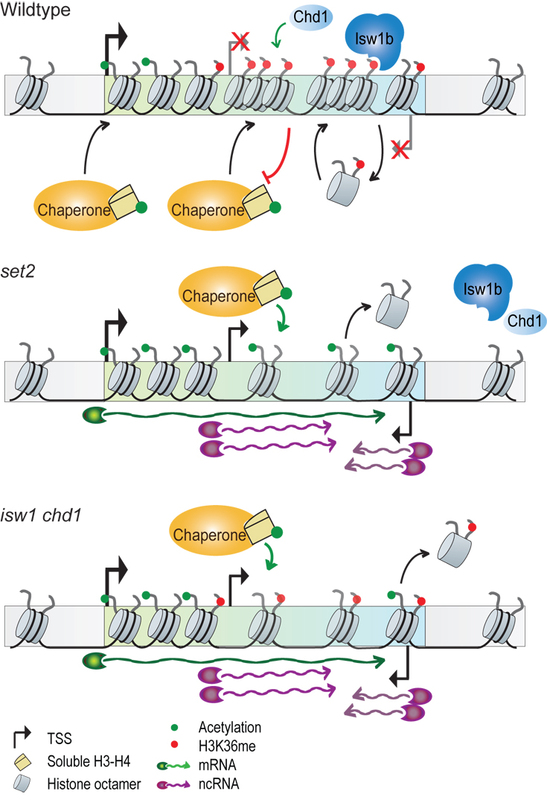 In contrast, deletion of either ISW1, CHD1 or SET2 interferes with this mechanism, resulting in the loss of existing nucleosomes and their replacement with highly acetylated histones that promotes the production of ncRNA. We are interested in identifying additional factors and the molecular mechanisms that help maintain an organised chromatin structure during transcription. The activities of chromatin remodellers can be modulated in a number of different ways, including recruitment, post-translational modifications and changes in substrate availability. We are interested in the molecular mechanisms that mediate these changes in remodeller activities both in vivo and in vitro. Most chromatin remodellers are large and fairly flexible multi-subunit complexes, which are difficult to crystallise, although some partial structures have been solved. Instead, we use small-angle scattering (SAS) which does not require crystals to obtain shape information on different chromatin remodelling complexes.